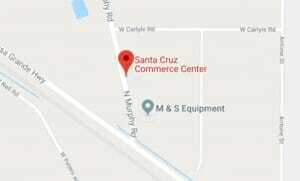 Located on Murphy Road on the west side of the Santa Cruz Commerce Center, the Mesquite Building, a multi-tenant office/warehouse complex, houses five suites. These cost-effective lease spaces are ideal for businesses that need offices with a large flex space for showroom, warehouse, or studio use. Construction of the Mesquite Building was completed in 2011 and fully leased in its first year. Read more about our Mesquite Building Case Study.